09 May What is the difference between faster- and slower-growing chicken? Today’s broiler chickens (chickens raised for meat) are bred to be bigger and grow faster than in years past. Why? In the past few decades, as people have become more conscious of their health and their wallets, consumer demand for chicken as a primary protein source has continued to climb. In fact, the demand for chicken is projected to increase 50% by 2050. And with consumer demand comes more choice. A chicken’s growth rate is measured by how long it takes the chicken to reach market weight. No matter how it is bred, chicken is a tremendous protein source, incredibly versatile, and one of the most efficient proteins – meaning for every pound of feed and every gallon of water we invest in our birds, we get back a larger amount of meat than with most other livestock and poultry. WHAT’S THE DIFFERENCE BETWEEN CONVENTIONALLY BRED BROILER CHICKENS AND SLOW GROWTH/HERITAGE BROILER CHICKEN? Conventionally bred broiler chickens: Most of the chicken available in the stores today comes from flocks that grow to market weight in about 48 days on average, using fewer natural resources – therefore more sustainably. 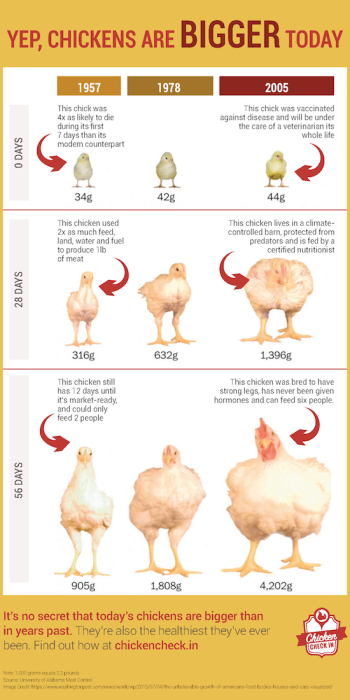 Compared to 25 years ago, today’s chickens now require seven percent less feed per pound to grow. Considering our national broiler flock eats about 57 million tons of feed per year – that is a lot of resources saved. Slow growth/Heritage broiler chickens: “Slower-growing” chickens or “Heritage breeds” are chickens that can take almost twice as long to reach market weight – about 81 days typically – because they do not convert feed to muscle as quickly. Because of this, these breeds require more feed, fuel, water and land per pound of meat to sustain their growth. As such, these products are typically 3x more expensive than their counterparts. ARE FASTER-GROWING PRACTICES DETRIMENTAL TO THE BIRDS’ HEALTH? There is a tremendous amount of science and animal husbandry that goes into today’s breeding of chickens, to ensure size and sustainability never comes at the expense of the birds’ health or welfare. While chickens today are bred to grow faster, they’re also bred to grow stronger and healthier than ever before, while requiring fewer natural resources to raise. In short, there’s a lot more to the chicken and egg story than just the birds and the bees. Farmers and scientists have strengthened the genetic lines of their flocks by identifying which animals are the healthiest and strongest, and then breeding them together. Today’s chicken breeders use DNA mapping and animal health diagnostic tools to detect underlying traits like heart health, susceptibility to disease, bone density and joint health to identify the best birds to breed, improving both the health and size of the next generation of chickens. For example, leg problems, due to the growing weight of a modern broiler chicken, are much less prevalent than they were 20 years ago because farmers and breeders began selecting them for leg strength and overall skeletal health. All of the data affirms that conventionally bred broiler chickens are as healthy as they ever have been. For example, all of these improvements have led to a drop in chicken on-farm mortality rates by 450 percent, compared to only several decades ago. WHAT ARE THE CHALLENGES OF PHASING IN “SLOWER GROWING” BROILERS TO CHICKEN FARMS? The biggest challenge in developing a breed for this market is not slow growth itself but the implications this has for the efficiency of how the birds convert feed to muscle (feed efficiency) and the greater resources required to grow poultry. This is not simply a cost factor, but has big implications for sustainability and the environmental impact of poultry production as a whole, as demand for chicken continues to escalate. All animals require a certain amount of energy daily to maintain themselves; slower growing birds will have greater total energy requirements because it takes more days for them to reach market weight. That means more corn and soybeans to feed them; more land and water to grow the feed; more fuel and emissions for transportation; and more manure produced. SHOULD I CHOOSE FASTER-GROWING OR SLOWER-GROWING CHICKEN FOR MY FAMILY? Everyone who purchases food for their family does so for a different reason, with different needs, wants and goals in mind – taste, price, values or convenience. No matter what kind of chicken you choose – be it organic, free-range, slow growing, or conventional chicken – you’ll have a nutritious, delicious, simple and versatile meal that your whole family is sure to enjoy. Chicken producers are in the business of providing you and your family with choices in grocery stores and restaurants. ARE “FASTER- GROWING” CHICKENS CAUSING QUALITY PROBLEMS WITH THE MEAT? You may have heard about a condition that affects the quality of a small percentage of chicken breast meat. “Woody breast,” as it is sometimes called, describes a quality issue stemming from a muscle abnormality in a small percentage of chicken meat in the U.S. This condition causes chicken breast meat to be hard to the touch and often pale in color with poor quality texture. “Woody breast” does not create any health or food safety concerns and the welfare of the chicken itself is not negatively impacted. The causes of “woody breast” are not known at this point, and researchers are working to determine causes and possible solutions. For more information visit our Q&A on “woody breast” here: https://www.chickencheck.in/faq/woody-breast-chicken/. For more information on fast growing chickens from veterinarians and poultry scientists, visit Best Food Facts: Get Up to Speed on Fast Growing Chickens. To see what daily life is like for a conventionally raised chicken, visit our “Day in the Life” section.